Small and lightweight pocket transmitter for the Synexis tour guide system. 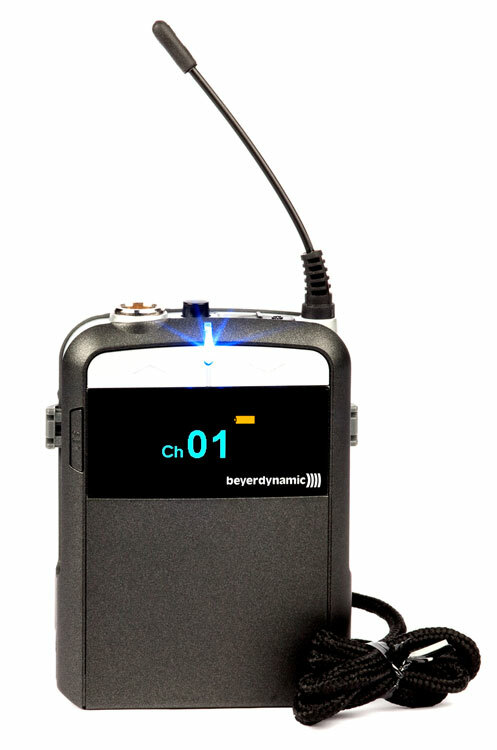 The Synexis TP8 is a small, lightweight pocket transmitter from the Beyerdynamic Synexis line of tour guide systems. You can rent it or buy it from us. Give hands-free presentations, lectures and tours with the Beyerdynamic TP8 and a suitable microphone-headset (we recommend the Beyerdynamic TG H55c). Depending on the architecture of the room/hall, the Synexis TP8 can achieve a range of over 100m when used in conjunction with our tour guide system's pocket receiver, the Synexis RP8. This means that even long distances (like the ones between the audience and the interpreter's booth or mixing console) can easily be covered. If an even greater range is needed, we recommend using our stationary transmitter (->Synexis TS8) in conjunction with a suitable antenna (->Beyerdynamic AT71); we'll be happy to rent them both to you. Tour guide systems in this configuration can even cover arenas and large exhibition halls. The TP8 clearly benefits from the vast experience in signal conversion/transmission that Beyerdynamic demonstrates in the professional recording-studio equipment field. Superb signal conversion and an approximately linear transfer ensure that your listeners hear you clearly and distinctly and that your voice sounds natural. At only 90g, the Synexis TP8 weighs less than a smartphone. The TP8 needn't shy away from comparison with smartphones when it comes to size either, coming in at a pocket-friendly 93 x 67 x 31.7 mm. Alternative signal sources like an MP3 player or mixing board can connect to the TP8 via its AUX input. These connections require appropriate adapter cables, so when renting from us, please let us know which equipment you'd like to connect, and we'll gladly enclose the right cable, free of charge. The Synexis RP8 has 18 programmable frequencies (very helpful, for example, at trade-fair events, at which several tour guide systems may be in use), a mute button to switch the microphone off, an easy-read display and a lanyard or belt clip to fasten the TP8 securely to your waistband, shoulder strap or belt. Tour guide systems and the Synexis TP from Radio-Rental.com – Enterprise Service included! This goes for our tour guide systems and conference equipment too. Our expert staff is regularly trained on the latest tour guide systems and has served our clients with great intuition and experience since 1999. When you rent tour guide systems, two-way radios or conference equipment with us, you get 24-hour access to our support crew via our toll-free number: 0800/1188440. Just press "1" and you'll connect – free of charge – with our support staff, who will assist you reliably and competently. Requesting a quote from us is fast and requires no commitment. We'll gladly provide you with all the information you need for your costing decision, and we'll be happy if our unbeatable values score some points with you too. Our deliveries (usually overnight via TNT) are just as fast as our quote process. The same goes for pick-up (also by TNT), included in all our rental offers. When you rent a tour guide system in Berlin, our partner Fahrwerk (a bicycle courier collective) handles delivery and pick-up.